Method for dough: In a large mixing bowl or the bowl of your stand mixer fitted with a hook attachment, combine the yeast and milk. Stir them around and let sit for 5 minutes or until the yeast is foamy. Next add the sugar, egg, salt and oil and mix everything well together. Add the flour and mix on low speed for a minute or two. Once everything is well combined knead with your hand for 7 minutes until you have a soft dough. Finally shape your dough into a ball and place in a large bowl that has been coated lightly with oil. Turn it over to coat all sides, cover it tightly with plastic wrap and allow to rise in a warm environment for an hour (I normally preheat the oven for a few minutes, turn it off then place the bowl in the oven. If the oven is too hot I leave the door open until it is just warm then I close it). 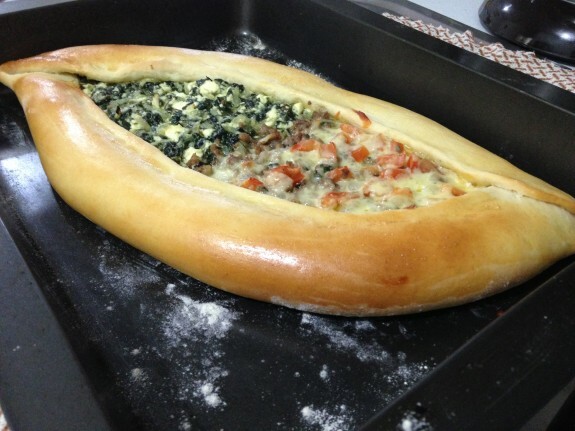 Divide the the dough into two balls and let rest for 10 minutes. 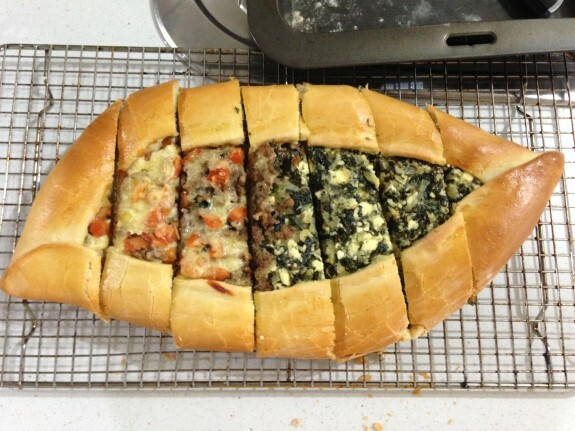 Method for mince filling: This can be prepared before or after dough is made. Place your frying pan on a medium heat, add oil or butter, followed by onion and sauté until onion is soft. Add the mince, salt, pepper and cumin. Salute until mince is cooked (approximately for 5-8 minutes). Let your mince cool. Once, it is cooled add the tomatoes, mint, parsley and lemon juice and mix them all together. Method for Spinach filling: Place your frying pan on a medium heat, add oil or butter. Add the onions and sauté until they are soft. Then add the spinach and salt and saute until no water is left from spinach. Let the spinach cool down. 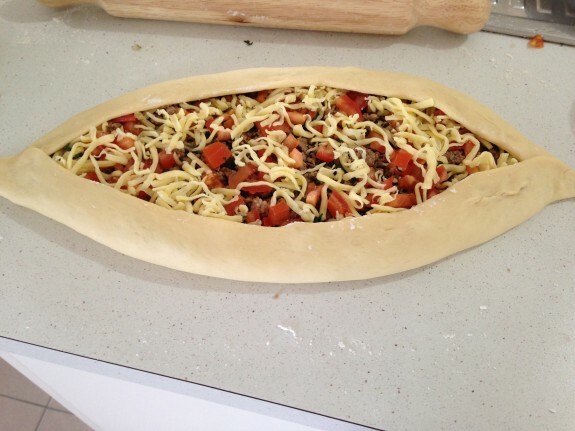 Using a rolling pin, roll each ball into an oval shape (about 18 inch), transfer your base into your oven tray, pat your dough with some cornflour so the filling doesn't make it soggy. Spread your favourite filling. Fold about 3cm of each side to form a border. Press the ends well and brush with egg. 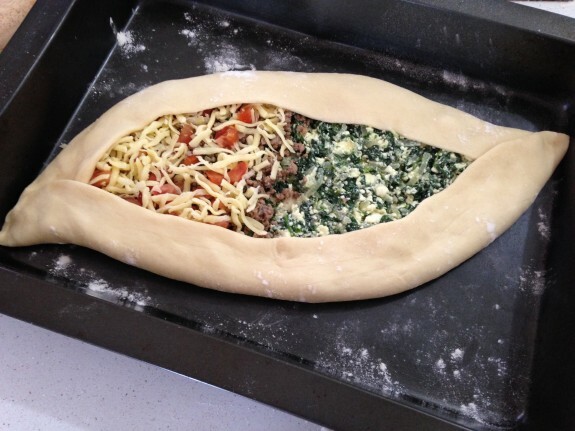 WITH SPINACH FILLING: spread the spinach then sprinkle the feta cheese on top. Bake until golden brown at 180 degrees.